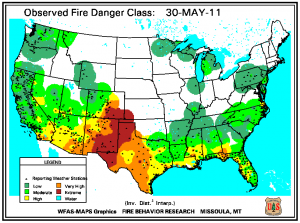 Wildfire Danger High In Parts of U.S.
Sweltering temperaturesÃ‚ across much of the eastern part of the United States over the holiday weekend got us thinking about another catastrophic risk: wildfires. The map below from the U.S. Forest Service Wildland Fire Assessment System indicates that the fire danger is currently high to extremely high in the southwestern U.S.
Wildfires destroyed a total of 12 homes in parts of Amarillo in the Texas Panhandle over the weekend. Meanwhile in Florida state officials say the danger of wildfire is very high throughout the state, due to lack of rain, low humidity and windy conditions. During the first four months of 2011 there were over 22,000 wildfires in the U.S., affecting 46 states, and burning more than 2 million acres, according toÃ‚ I.I.I. facts and statistics on wildfires. In 2010 catastrophic wildfires caused $210 million in insured losses and $314 million in total economic losses, according to Munich Re. Although eight of the 10 costliest U.S. wildfires in history, based on insured losses, occurred in California, Texas has had the greatest number of wildfires in the last three years. However, wildfires are a national problem affecting almost every state. Check out theÃ‚ National Interagency Fire Center for the latest fire outlook for May through August. The Joplin, Missouri tornado has been ranked by NOAAÃ¢â‚¬â„¢s Storm Prediction Center (SPC) as the eighth deadliest tornado in United States history. With its estimated death toll of 124 (and rising), right now this makes it the most deadly tornado to hit the U.S. since 1947. The Joplin event adds to what was already the second deadliest year ever for tornado-related deaths in the U.S., according to the Insurance Information Institute (I.I.I.). Tornadoes killed 747 people in the U.S. in 1925. Latest data from NOAAÃ¢â‚¬â„¢s SPC through May 23, 2011, shows about 483 tornado-related fatalities have occurred so far this year. Over at Wunderblog Dr. Jeff Masters observes that this yearÃ¢â‚¬â„¢s high death toll from tornadoes is partly just bad luck. If youÃ¢â‚¬â„¢re wondering whether this has happened before, the answer is yes. According to Wunderblog, this sort of bad luck occurred in both 1953, when F-5 tornadoes hit Flint, Michigan (116 killed), Worcester, Massachusetts (90 killed), and Waco, Texas (114 killed), and in 1936, when F-5s hit Tupelo, Mississippi (216 killed) and Gainesville, Georgia (203 killed). For more information on insured losses arising from the Joplin tornado, check out this articleÃ‚ from PropertyCasualty360.com. Ready For Zombies, Hurricanes, Floods? Preparing for hurricane season? Or for an invasion of zombies? 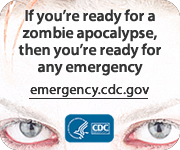 Either way, the Centers for Disease Control and Prevention (CDC) has you covered. Once you’ve made your emergency kit, the CDCÃ‚ wisely suggests youÃ‚ sit down with your family and come up with an emergency plan. This includes where you would go and who you would call if zombies started appearing outside your door step. You can also implement this plan if there is a flood, earthquake, or other emergency. WhileÃ‚ the Insurance Information Institute (I.I.I. )Ã‚ may not have tips for managing zombie risk,Ã‚ we doÃ‚ recommend you have an up-to-date home inventory to be prepared for any disaster. To help you create this inventory, check out our free online home inventory tool Know Your Stuff. 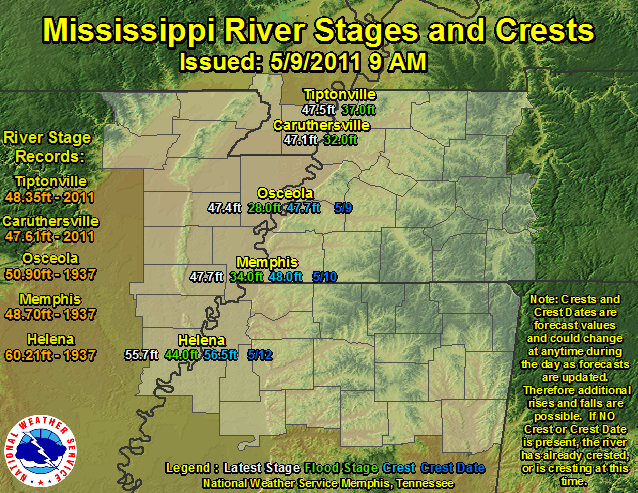 Latest information from the National Weather Service (NWS) in Memphis, Tennessee indicates that the Mississippi River is expected to crest at around 48 feet tomorrow Ã¢â‚¬“ the second highest level on record at Memphis. The long-standing Memphis record is 48.7 feet, a level reached during the great flood of 1937. Heavy, extended rainfall and record snow melt have contributed to what is becoming a major flood event of America’s largest river. You may remember in MarchÃ‚ our fellow blogger Jim Lynch reported on the NWS warningÃ‚ of the potential for widespread, record flooding this Spring. The flood crest along the Mississippi is forecast to move slowly downstream towards New Orleans during the next three weeks. The U.S. Army Corps of Engineers has already opened one spillway upstream from New Orleans to reduce the volume of water as it surges southward and today is opening a second: the Bonnet CarrÃƒ © Spillway. A third and final spillway could be opened later this week. Check out Dr. Jeff MastersÃ¢â‚¬â„¢ Wunderblog for a timely and fact-filled update on this event. From the insurance standpoint, while the optional comprehensive portion of an auto insurance policy includes coverage for flood damage, it is excluded under standard homeowners and renters insurance policies. Flood coverage for homeowners and renters is available in the form of a separate policy from the federal governmentÃ¢â‚¬â„¢s National Flood Insurance Program (NFIP) and from a few private insurers. Check out this Insurance Information Institute (I.I.I.) backgrounder on flood insurance to find more on how the NFIP works.